Urs celebrations of Sufi saint Hazrat Lal Shahbaz Qalandar will start in Sehwan Sharif from today (Monday). Thousands of devotees have gathered here from every nook and corner of the country to attend the annual celebrations. The Lahore High Court has ordered the Railways authorities to run a special train to take the devotees to the Urs. Special arrangements have been put in place by the provincial government to facilitate the pilgrims. Lungar and Sabeels have been set up all around the shrine. Syed Usman Marwandi or known as Hazrat Lal Shahbaz Qalandar (1177–1274) is a Syed Sufi saint, philosopher, poet, and qalandar. Born Syed Hussain Shah, he belonged to the Suhrawardiyya order of Sufis. He preached religious tolerance among Muslims and Hindus. His mysticism attracted people from all religions. He was called Lal (red) after his usual red attire,Shahbaz due to his noble and divine spirit, and Qalandar for his Sufi affiliation. Many Hindus regard him as the incarnation of Bhrithari while others (Hindus from Sindh) consider him as an emanation of Jhule lal. 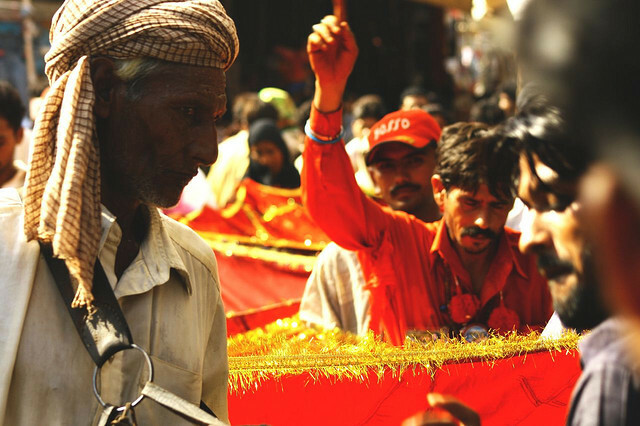 Thousands of pilgrims visit his shrine in Sehwan every year, especially at the occasion of his Urs. LIFE: Shahbaz Qalandar was born in Maiwand, Afghanistan to a dervish, Syed Ibrahim Kabiruddin whose ancestors had migrated from Baghdadand settled in Mashhad, a center of learning and civilization, before migrating again to Marwand. During his lifetime he witnessed the Ghaznavid and Ghurids rules in South Asia. It is believed he arrived inSehwan in 1251. He established a Khanqah there and taught in the Fuqhai Islam Madarrsah: during this period he wrote his treatises Mizna-e-Sart, Kism-e-Doyum, Aqdand Zubdah. In Multan Lal Shahbaz met Bahauddin Zachariah Multani of the Suhrwardiyya, Baba Farid Ganjshakar of the Chishtiyya and Makhdoom Jahanian Surkh Bukhari. Their friendship became legendary: they were known as Chahar Yar (Persian = the four friends). His dedication to the knowledge of various religious disciplines enabled him to eventually become a profound scholar. He became fluent in many languages includingPersian, Turkish, Arabic, Sindhi and Sanskrit. He died in 1274 after living 97 years. LEGENDS AND STORIES: On his way from Balochistan to Sindh he stayed in present-day Karachi’s Manghopir area for meditation (Muraqaba), and it is said that Manghopir’s natural warm fountain started to flow from beneath the hill on which Lal Shahbaz sat. The fountain is still flowing continuously and is said to have miraculous healing power especially for asthma patients. It is also believed that he turned into a falcon to pick up his friend Baba Fariduddin Ganjshakar from the gallows. Another legend tells that the incumbent fakirs in Sehwan sent him a bowl of milk filled to the brim, indicating that there was no room for anything more. But he returned the bowl with a beautiful flower floating on the top. Baba Sajid Saleem, an expert on Sufi legend, teaching in GIKI head of humanities department, also narrates another legend, in which a fellow Murid was requested meat by Shahbaz. The fellow Murid went to a town of pagans. The pagans tear the fellow and ate him. When Shahbaz knew about the incident he called him as if he was listening. The Murid came out of the stomach of pagans, integrated into the Murid and came back to service of Lal Shahbaz Qalandar.